What kind of veins can be treated? functioning correctly, blood can flow backwards and pool, stretching the vein and resulting in a vascular lesion. 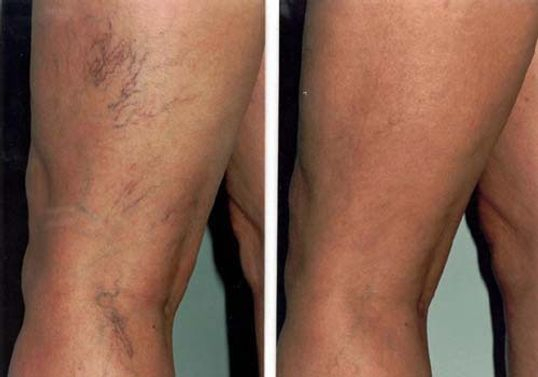 Blood vessels fall into two groups: spider veins (telangiectasias) and varicose veins. Spider veins are visible on the surface of the skin as red, blue or purple lines. Varicose veins are larger and deeper and often look blue or bumpy under the skin. We do effectively treat spider veins , which are most commonly found on the legs and face. By tracing the path of each spider vein, the energy from the laser will coagulate and shrink the vessel. All body parts can be treated: face, neck, chest, arms, legs, etc. Initial cooling and a chilled tip handpiece allows safe and virtually pain free treatment. discomfort if present at all depends upon the concentration of cromophore in the veins, and the treatment site. Some areas of the body are just more sensitive. Laser light energy when absorbed turns into heat energy what creates a sensation. Consequently it has more sensation in denser veins. However no anesthesia is required and most patients describe the discomfort as mild and acceptable, it feels much like a rubber band snap or pin-prick with heat sensation. Many patients say they barely feel anything during the treatment due to the implemented cooling system. depend on personal individual factors we recommend 1-3 treatments for full clearing of the treated veins. Deeper seated veins usually require more sessions. Individual results may vary. After one treatment, you can expect a 70%-80% improvement. After 45-60days,you can have the second treatment. touch up treatments may be necessary. Yes, it only takes a couple minutes to get rid of this bothersome aesthetic problem with the laser procedure. Tattoos or permanent makeup in area to be treated. Skin trauma, lesions, sores or open wounds, contagious skin diseases. Active Herpes in the area to be treated. sponges/scrubs, glycolic, alpha and/or beta hydroxyl acid at least 24 hours before your treatment. History of keloid or hypertrophic scarring. History of moles or skin cancer, melanoma. If you are under 18, you can only receive treatments at the Szexepil Szalon if you present written consent from your parent or guardian. The treatment is performed by a medical doctor. What is the cost per session ? How can I apply for a consultation ?